Hey everyone! I'm very excited to be able to share this diy project with you. I've been slowly searching for ideas for a new headboard. I've partnered up with this really cool company called MyCorkFloor.com they have so many different finishes to choose from so, i've decided to use their cork strips and turn it into a really beautiful headboard. We all know headboards can be costly. 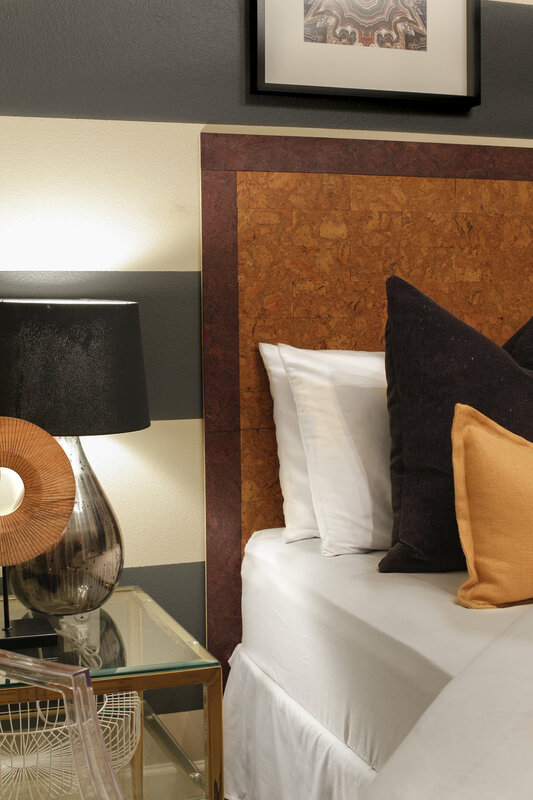 Initially these cork strips are meant to be used on your floor but I decided to use them to create a custom headboard to show case my personal style. Here's a way to get the luxury look without paying the expensive price tag. This project you will need plywood or MDF headboard. I made my headboard to fit a queen size. Here are the correct sizes, if you are wanting to make a king, twin or full. A good pair of scissors(i used my scissors that i have with my knife set) that will cut through the cork, A pen or sharpie to mark your cuts. Tape measure, paint roller, and the cork adhesive. Don't worry MyCorkFloor.com also carries adhesive. Lastly, cork color of your choice. The great thing about MyCorkFloor.com they have several finishes to choose from. For this project, I've chosen their Smoke and Oak Finish, two beautiful colors that compliments each other. Remember to measure twice, cut once! I decided to cut my strips into 10'' wide strips to create a brick inlay. The design possibilities are endless! you can design any pattern to showcase your personal style. once you've marked your cork. Now, it's time to cut! Apply the adhesive.. I just poured it onto the surface. You can dip the paint roller but i like this method. Its much more fun! Using your paint roller, apply the adhesive evenly. After applying the adhesive, let it dry for about 3-5minutes. Don't be afraid of the adhesive drying up, It will bond better with the cork. Now lets put our cut corks into place.. If you measured correctly, now everything should fit into place, just like a large puzzle! so much fun! Voila! Here is the final product! Doesn't that look so Beautiful? Which design will you create? 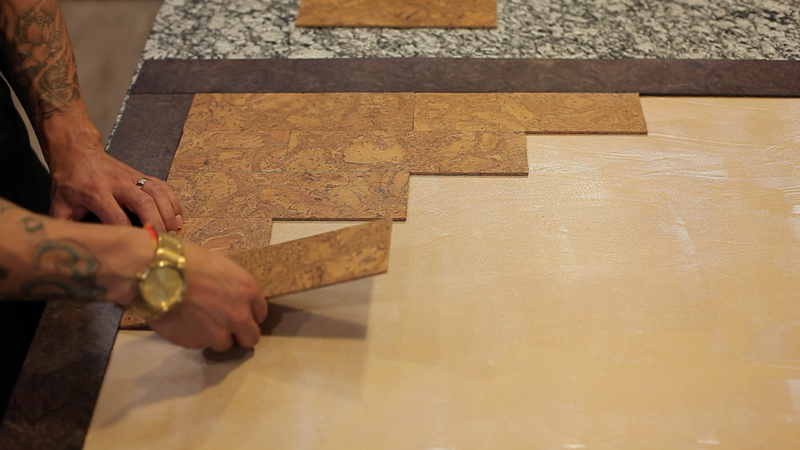 Head over to MyCorkFloor.com to get started on your next DIY project. Checkout my Instagram @CesarChavezDesign and YouTube for more design tips and inspiration on "How to design the home of your dreams at any budget." Welcome back everyone! Learn how to transform a plain coffee table into a beautiful centerpiece for your living room. I've had this coffee table that's been sitting in my garage for over a year now. I didn't want to toss it, it's in pretty great condition, I honestly was not sure what to do with it. I knew it needed some TLC. visually, I wasn't sure what to do with it. I was searching online for some inspiration and came across this website called MyCorkFloor.com, They have several cork colors like, Oak, Henna, and a dark smoke color. I thought it would be perfect, if I put a chevron pattern design to add a focal point to my living room. it would be the perfect conversation piece when i have guests over. so, before getting started i recommend you lightly sand the surface down. Make sure to clean the dust after sanding. 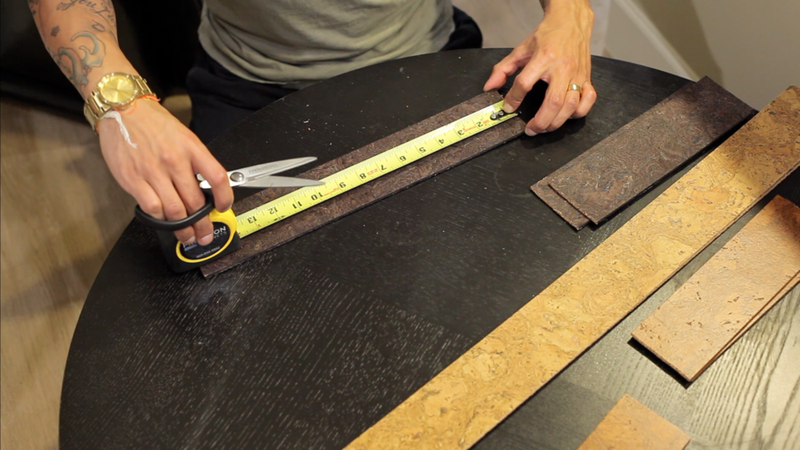 Initially the cork strips are meant to be used on your floors but, being the DIY expert that I am. I decided to revamp my old coffee table instead. It's super to install. No power tools needed for this project. You'll need a pair of scissors, paint roller, measuring tape and latex contact adhesive. First, using your paint roller apply the adhesive. after applying the adhesive evenly, let it dry for 10minutes. It will stick better with the cork. I cut the cork into 10 inch strips using scissors. I'm creating a chevron patter but you can create your own pattern. The design possibilities are endless. This unique coffee table features all three cork colors. don't worry about the excess cork hanging over. Once the coffee table is covered with cork. Let it dry over for 24 hours. Now it's time to cut the excess cork. I turned the coffee table over so I can have some kind of guidance around the table. What do you think of the transformation? Which design will you create? 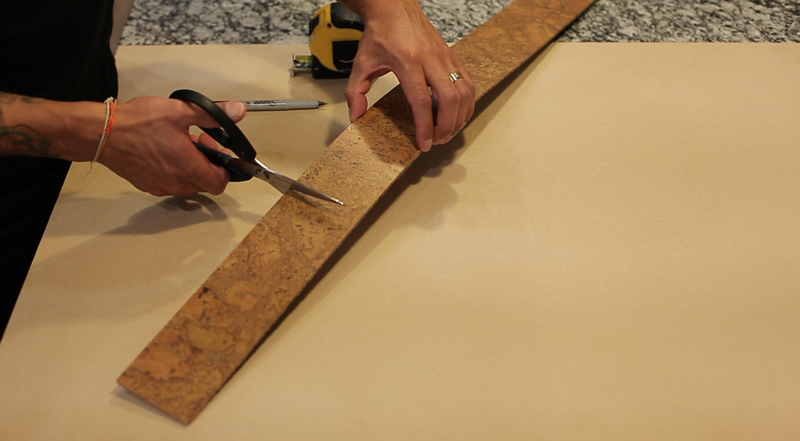 Head over to MyCorkFloor.com to get started on your next DIY project. Checkout my Instagram @CesarChavezDesign and YouTube for more design tips and inspiration on "How to design the home of your dreams at any budget." Hi Everyone! I would like to share with you, a really fast and easy way to add some personality to your kitchen and or bathroom. I recently discovered a product called Aspect Peel & Stick Tile. We all know if you're thinking about tiling a backsplash, It can be expensive hiring a contractor or if you're looking to do it yourself, you have to worry about the mess of adhesive and grout. 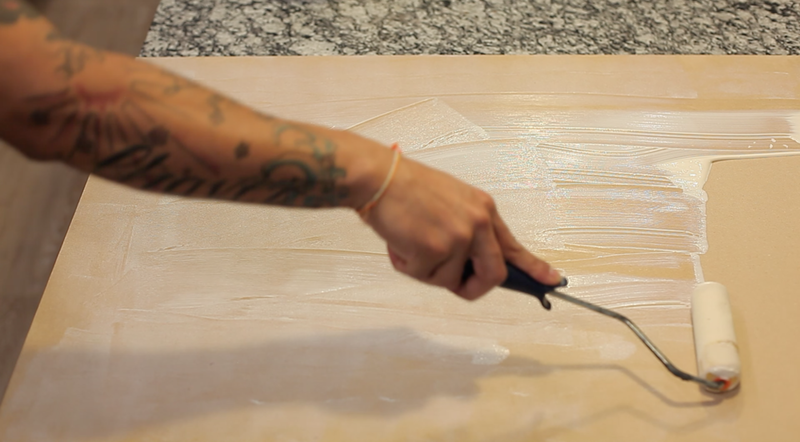 Well, Aspect tile is super easy to install with a self-adhesive backing and the best part is that it doesn't require any glue or grout, which saves you time and mess. I know you all are wondering, how am I suppose to cut the tiles. Well, I used a tile to cutter, which you can pick up at your local home improvement store. I will have a picture and discription down below to show you which one I used for my project. Aspect tiles comes in metal, stone and glass. I created this sleek backsplash focal point using their neutral and warm earthy tone glass tiles that you see here in the photo. Now you're ready to mount your tiles on the wall. Just peel and stick and don't panic! if you don't like the placement of the tile. Just remove the tile with a putty knife. simple and easy! HDX Tile cutter from HomeDepot which cost only 19.97$ as an alternative, you can always use a tile saw, but only if you have experience using it. Keep in mind, Safety first! It's definitely one of the easiest ways to update your backsplash in minutes. Head over to Aspectideas.com to get started on your next project. Don't forget to checkout my Instagram page @CesarChavezDesign for more design inspiration on "How to Design the Home of your Dreams at any budget"
Transform your kitchen with these budget friendly ideas. Hi Everyone, We all know Kitchens can be really expensive to remodel. I will share some of my DIY secrets with you. Top 5 DIY Pallet Projects! We can all agree that pallets have been overlooked and tossed out. I've tossed out pallets for years because I wasn't sure what to do with them, but not anymore! You can create really awesome décor using reclaimed pallets. Pallets are super inexpensive or you can find them for cheap and most cases, free! If you're not sure where to find pallets. You can always call your local warehouses or sometimes even grocery stores give them out, so I would suggest to speak with a manager before taking. For this post, I'm going to share my top DIY pallet transformations to help you get started on your next DIY Project. This beautiful coffee table was made with using just two pallets. By sandwiching two pallets together creates the proper height for a coffee table and for easy movement you can always add casters to the bottom of the coffee table to give it that mobility. This is a simple wine rack made from the end section of a pallet. If you are a lover of wine, you will definitely make use of this rack especially for those who are in love with that rustic style. Here's another great idea on how to turn pallets into something useful for your outdoor space. Again, sandwich two pallets together and place concrete stepping stones on top as the bar countertops. Awesome addition in hosting your summer parties! Add a touch of rustic home decor with a DIY wood pallet wall. Definitely feels cozy with this bold statement wall. looks great and adds some beautiful texture to the room. There are so many great benefits to having a stylish barn door. Barn doors add a lot of character, saves space because you don't have to worry about the door swing and it looks amazing, it's super easy and who cannot forget, it's inexpensive and its made out of pallet wood. "Let's brighten up your space and give it the designer look!" Light fixtures are the most important aspect of a room. Designers love layering lights in a room to create different types of spaces within it. Selecting proper lighting doesn't have to be complicated. It can help improve your space drastically, Here's a great tip! Use multiple light sources around the room to create an open feel, such as floor lamps in corners and table lamps on end tables. This will create unity within your space, while still having that amazing look. Consider this, when purchasing a light fixture you should think about what style you're going for, is it color, shape, or the most important part, is it size? Ambient Lighting: Chandeliers are beautiful and can create a statement for any room, for instance sitting rooms, bedrooms, above kitchen islands and dining rooms. chandeliers help's keep the eyes moving throughout the space. Task Lighting: helps light up areas for your daily activities, such as cooking areas, reading. For instance under cabinet lighting is a great example. It is one of the most important aspect in a kitchen. Not only is it beautiful, but it is there to highlight the area so you can prep your food properly. There are many ways to achieve task lighting in your space. Here are just a few Recessed lighting, Pendent lighting, tables lamps are all great for simple task lighting. Accent Lighting: It's the jewelry to give your space that designer look. It's normally there to highlight objects or architectural elements in a space. Accent lights is a simple way to enhance the atmosphere of any room. Keep in mind you shouldn't completely relay on accent lighting as your main source of light. I'm all about creating timeless and unique spaces for my clients. I just finished this beautiful kitchen redesign, which allowed me to incorporate some of my favorite DIY projects. For instance, we used Faux Beams to add a rustic element to this farmhouse kitchen design. I also made these really cool expensive Roman Shades that I sewed myself and we put shiplap on the walls to give this once outdated kitchen a country look. I know what you're thinking, shiplap? is way too expensive? Especially if you're planning on using it to cover the majority of your walls. Well, I found an inexpensive version to get the look of shiplap, but on a smaller budget. It's a super easy process. Don't worry I will show you how. Before you get started you will need to run to your local hardware store, I went to Home Depot and picked up 8'x 4' sheets of Plywood. which cost only around 11$ per sheet. make sure it's 1/4'' thick. You'll need to have the sheets cut into 6'' strips and don't worry if you don't own a saw. Home Depot can cut the sheets for you for a small price. Once the strips are cut I decided I wanted a clean look when the panels are up, so I sanded down the edges, but you can definitely have it look more rustic and country if you choose not to sand the edges. In order to get that perfect little space in between the shiplap panels. You will need to use Nickels as spacers. The next step is to nail down the shiplap panels. I used a nail gun and air compressor, which was super easy to use. You can also use adhesive for a stronger bond with the walls and shiplap panels. I should mention you will definitely need lots and lots of nails depending on how much shiplap you are putting up your walls. Now it's time to fill those nail holes with wood spackle, but again depending if you want the panels to look aged and distressed, You can just leave the nail hole exposed. I went with filling the nail holes for a more polished contemporary farmhouse style look. The fun part begins! I used a beautiful dark grey color on the walls called Zinc Dust By Kelly Moore. I painted two coats just to be on the safe side. I know wood soaks up the paint, so two coats did the job. I applied the rich dark color by using a four inch roller and a small thin paint brush to get in between the shiplap horizontal gaps. Excuse the Speaker and coffee, I definitely needed music and coffee to keep me going on this long painting process. For more design inspiration please checkout my Instagram page @CesarChavezDesign and don't forget to Subscribe to my YouTube channel for more inexpensive DIY projects and design tips @designedby.CesarChavezand Remember You can Design the Home of your Dreams at any budget! "Do's & Don'ts of Interior Design"
Every inch of your space should be decorated, especially those lonely empty corners. It tends to be challenging at times because we place furniture just to fill in the space. In our minds, it looks as if the space needs to be accessorize with furniture pieces, but sometimes empty corners are acceptable. It keeps the space from feeling less crowded, but it all depends on the size of your space. Here are a couple of DO's and Don'ts for the next time your decorating your home. Random pieces of furniture tends to make the corner feel crowned. Give your space life by adding tall plants. There are so many great benefits to having a household plant. 1. it provides clean air circulation 2. Boosting your mood, making you feeling happy. 3. plants help you breath easier. These living organisms interact with your body, mind and home in ways that enhance the quality of life. Sure, a centerpiece can tie the room together creating a beautiful scene. One mistake that most of us make is to have a large tall centerpiece that restricts your guests from conversating with others on the opposite side of the dinner table. Here's something to keep in mind for the next time you're hosting a dinner party. If you can't see or talk to people across the table without moving your head or standing up. even though your tall centerpiece looks beautiful maybe it's not the place for a that tall arrangement. Tall vases or tall flower arrangements are great for entry console tables. Low centerpieces are perfect! It allows guests to see who they are chatting with. The perfect size for an Area Rug. Hello everyone! I remember moving into my first apartment at the age of 18. I didn't have much money to spend on furniture at that time so That was when my revamping creativity basically started. The furnishings that I did have, were handed down to me. During those days, there was not a craigslist, so receiving second hand furnishings was a plus. My revamping skills allowed me to take something used and give it a fresh new life with my own taste to it. Take this piece from IKEA, yes, I had this Ikea dresser for sometime now. It was plain, boring, and had no life at all. I decided, why not add a cool design to the front drawer. I remember stumbling across this awesome Instagram page called MYOVERLAYS. You're able to create unique panels that fit onto any of your furniture pieces, mirrors, and walls. The pattern on my IKEA dresser is one that I designed myself, however, you can choose from one of many designs on MyOverlay's.com Checkout the full Tutorial on my YouTube channel at YouTube.com/Designedby.cesarchavez. So, how about we all try something new this spring and repurpose those old furnishings that you might consider letting go. I love creating bold statement pieces for my home. I honestly believe every piece of decor or furniture should tell a story, that's what makes it unique. This particular furniture piece I found on Craigslist. It's one of my favorite site's to find free furnishings. I definitely scored on the piece. This is a Restoration Hardware piece that I aquired for free. I knew, I wanted to paint this awesome sideboard, but wasn't sure which paint to use. After doing some research, I found this fantastic paint product called VINTAGE AND RESTORE BY K. It allows you to paint furniture without any sanding or priming, which is a plus in my books because it leaves the prep behind. First, you'll need to paint the whole entire piece a solid color. Don't forget to remove any hardware if need. After the project is complete you can place the same hardware back on the furniture piece or you can replace them with brand new one's. Here's a quick design trend tip! Brass hardware is really popular for 2017. Once you painted the entire furniture piece, now it's time to grab your pencil and start measuring. what I did was measured the top length and divided it by 8 squares. Which gave me an even amount of squares. Don't forget to measure the width too! divided the width by 3 for three row of vertical squares. Once all your measurements and squares are evenly consistent. Use Painters tape to conceal the areas you don't want to paint. Be sure to press firmly down on the tape. You don't want paint to bleed through. Once you tape off your beautiful design/pattern. Use a small paint roller or small size brush to apply your contrasting color paint. Continue the painting process for each square design. Let your paint dry for at least 20 to 30 minutes. Now it's time to have some fun! Start removing the painters tape to see your beautiful work! Painting was fun, right? I love this project, because it didn't require any sanding. It allows you to dive right into the painting. Super easy and adds a personal touch to your home. head over to VINTAGEANDRESTOREBYK.COM to get started on your next painting project. Remember, you can design the home of you dreams at any budget. 1.) Add crown molding or picture rail to make the ceiling height seem lower. 2.) Wallpaper is a great way to trick the eye of a lower ceiling and adds a designer look to your space. 3.) Adding decorative elements to the room, for example use beams to create visual interest or add shiplap or wood panel for a little texture. 4.) Less expensive trick is to add task light throughout the space. (table lamps, floor lamps, track lighting) lighting will lead the eyes ways from those super high ceilings. 5.) Designers use this trick all the time. paint a darker color on the ceiling. Painting is a simple diy project that most people can do on themselves. Top 5 ways to add color to a room without painting. There are so many ways that you can add color to a room without painting the walls. especially if you live in a rental. 1.) Go big! with colorful artwork. Large colorful artwork adds a pop of color and focal point to the room. Focal points are really important in the Interior design industry. It's the first thing that gets our attention when entering a room. 2.) Here's a chance to put your own personal style to a room by adding bold colorful Throw pillows or throw blankets. pair pillows in threes or just two flanking each side of the sofa. 3.) Invest in a colorful sofa or reupholster your existing sofa for a fresh colorful new look. 4.) Fill your home with plants. Adding plants or flowers around your home can bring interest and color to your home. "Tip" plants are a great way to hide any cord running along the floors. 5.) Try incorporating bold and colorful drapery for vertical interest. by placing the drapery rod higher towards the ceiling, it makes the ceiling feel higher than they actually are.